The Flemish Giant is an old breed of rabbit thought to have originated from the Flemish region as early as the 16th or 17th century, around the city of Ghent, Belgium. English records show that in 1860, travellers from the continent spoke of an enormous rabbit from the area of Flanders and parts of France. At that time English rabbit breeders were breeding rabbits around 7 or 8lbs (3.18 to 3.64 Kilos) and were having trouble meeting the growing demand for rabbit meat and fur. Importing giant rabbits from the continent would go a long way to solving that problem. The Flemish Giant started to appear at rabbit shows with the original Flemish Giant weighing about 14lb (6.35 Kilos) and the first breeding standards being written in 1893. At this time, the colouring for a Flemish Giant was an iron grey colour with sandy or white bar markings on the legs and long, bent tipped, ears. There are now 7 colours, Black, Blue, Fawn, Light grey, Sandy steel and White, with the least common colour being blue. Sizes now range from 14 to 20 lbs (6.36 to 9.09 Kilos). Today the Flemish Giant is one of the more popular breeds to be found at rabbit shows, and is promoted by the National Federation of Flemish giant rabbit breeders, which was founded in 1915. It is possibly the second oldest breed in the United States. It is likely the Flemish Giant descended from the meat and fur breeds, including the steenkonijn (stone rabbit) and the European 'patagonian' breed, which although now extinct, was once a land race breed, bred in Belgium and France. 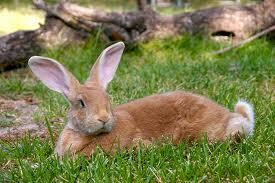 Probably an ancestor of rabbits bred for the 'rabbit boom' where an attempt was made to improve the size of the meat. The Argentinean 'patagonion' rabbit is not related. The theory that it is, may come from the belief that traders, during the 16th and 17th century, brought back giant rabbits to Europe from Argentina, where they were cross bred with the rabbits of Flanders. The Flemish Giant has two nicknames. 'Gentle giant' which speaks for its character and temperament while the other nickname; 'Universal rabbit' comes from its multipurpose of pet rabbit, show rabbit, breeding and meat/fur uses. Being one of the largest of the domestic pet rabbits, it has a semi arched back starting at back of shoulders to the base of the tail. The long powerful body, which can be 32" (80cm) in length, has a white underside with a dark base colouring, with broad hind quarters. The males (bucks) have a broad head, which the females (does), do not and does may have a large evenly spread dewlap (fold of skin under the chin). The fur is glossy, short and dense, with grooming being no more than usual. The ears are around 8" (20cm) long, standing erect, there may be light rings around the eyes. Due to the rabbit's size, a hutch is not ideal and certainly not one with different levels. You may wish to consider a custom made hutch, with a large door for the rabbit's access, or perhaps a dog crate would be better than a hutch. If the rabbit is kept indoors you could use a dog basket or maybe a large pen. The US dept of Agriculture standards for rabbits over 12 lbs (5.45 Kilos), advise at least 5 sq ft (.50 Sq Meters) of floor space for rabbits of such sizes and elsewhere you will find suggestions of minimum hutch sizes for large rabbits to be 14"High x 36" Depth x 48" Width (36x91x122 cm). This size allows the rabbit very little room and whatever you decide upon, just bear in mind the fully grown size can be from 14 to 20lbs (6.36 to 9.09 Kilos). Care for the Flemish Giant is the same as with all rabbits but a rabbit of such size needs a lot of attention and handling from the beginning or a young age. If the rabbit is not used to handling, then you will have big problems later on when, for example, you need to pick them up or examine them. Rabbits of sizes similar to the Flemish Giant can be heavy to lift when fully grown. Flemish Giants are gentle, intelligent, they have good personalities, are well tempered, calm and not as lively as the smaller breeds. They make extremely good pets and are good with children. Because of their size, children are unlikely to hurt them by picking up or dropping them. They also get on well with other pets and can live easily with smaller rabbits, but you need to be careful with any introduction to smaller rabbits. Although they can cope with cold temperatures, they do not fare so well with the heat. They must have exercise and it needs to be remembered that they will be more expensive to keep. They will eat a lot more than the smaller breeds, requiring more hay; they excrete more and need larger living accommodation. A good daily dietary guide is one to two cups of chopped leafy vegetable and one to two tablespoons of carrots or fruit per 6lb. Larger rabbits can find it harder to clean and/or groom their lower quarters than smaller rabbits, especially as they get older and you must expect more moulting. Larger rabbits can become high maintenance as get older, though no more than a dog would. They can live up to 5 years or more but as with all rabbits, the life span is dependent on diet and care given. A buck can take one and a half years, whilst a doe can take one year to reach maturity. Owing to its size it is important not to let the Flemish Giant become overweight, as this can lead to joint and motility problems. Flystrike can also be more of a problem in overweight or older rabbits of this size. 1. Colour - Dark steel grey, with even or wavy ticking over the whole of the body, head, ears, chest and feet alike, except belly and under tail which shall be white, upon the surface of the fur. Any grey, steel, sandy or other shade on the belly or under tail, except a streak of grey in each groin, shall disqualify. 2. Size & Weight - Bucks shall not be less than 4.974kg (11lb) and doe’s not less than 5.44kg (12lb). Size shall be considered irrespective of weight. 3. Body - Large, roomy and flat, broad fore and hindquarters. Does shall have a dewlap, evenly carried. 4. Legs & Feet - Shall be in length proportionate to body, strong in bone, large and straight. Feet shall be velvety, dark and ticked. Ticking to show when coat rubbed back. 5. Head & Ears - Head shall be large, full and shapely. Eyes shall be bold and dark brown in colour. Ears shall be erect. Dark face allowed. 6. Coat & Condition - Full short coat, firm in flesh and moderately thick. Free from cold. INTERMEDIATE FLEMISH 1. To be judged to the Giant Standard 2. Age to be over 6 months old. 3. Weight - Buck to be less than 4.989kg (11lb). Doe to be under 5.443kg(12lb). AMPLIFICAITON OF COLOUR: The under should be blue at the base for a little more than a third of the length, then black, merging into a creamy, or bluish white ticking which may be again tipped with black. In even ticked specimens, the mixture should show half grey and half black tipped hairs over half of the body, neck, face and ears, but may be interspersed with longer yet – black hairs, both even and wavy ticking being permissible. The whole should be uniform in colour. The under parts to be white with blue under-colour. Tail should be ticked rather darker on top, white on the underside.